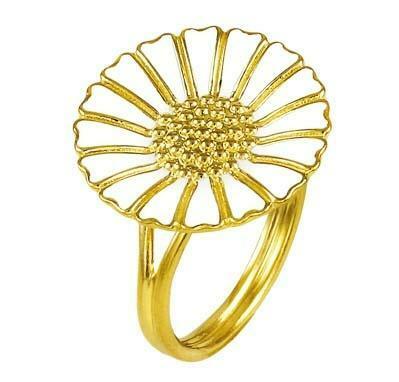 This stunning Daisy ring from Lund Copenhagen is made from 22ct Gold finished with crisp white Enamel. The daisy measures 18mm across, making this large ring a real statement piece. We love the combination of bright Gold and crisp white Enamel which make the Lund collection unmistakable. It's a beautiful addition to a Lund collection or for anyone who loves daisies. The Lund collection in Gold and white Enamel features earrings, pendants and bracelets and make a beautiful set. Also available in Silver and black Enamel or featuring a smaller daisy.